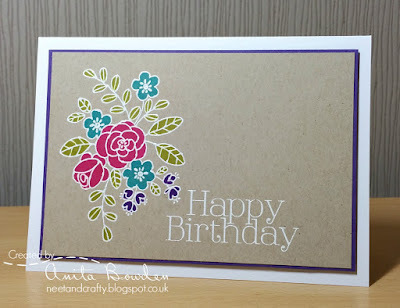 Val used Acid Drops and Whatnots stamps for her fabulous card! and Pink Petticoat before fuzzy cutting and adhering to the stamped images. Landscape Trio die to create a bank of snow. 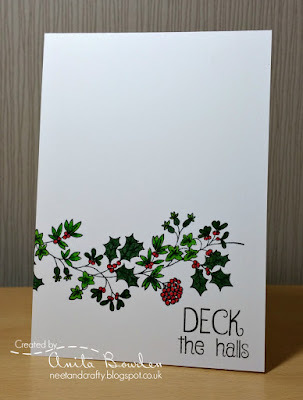 both of these from Santa Express by Doodlebug. 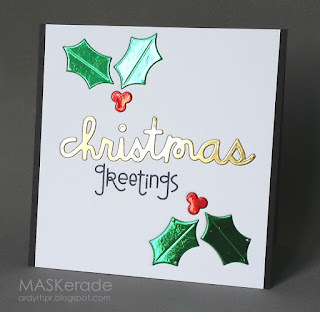 The bow was stamped onto a piece of gold shimmer paper from my stash. by Clearly Besotted. The panel was popped up on 3D foam strips. Technique Tuesday birdies paper pieced onto kraft card using some Basic Grey DP and a Whiff of Joy sentiment. 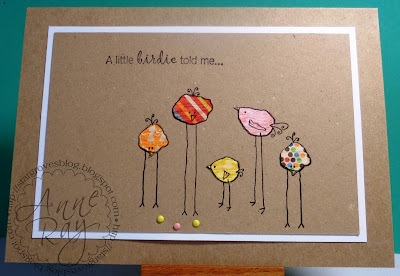 I don't have any enamel dots, so I used some tiny brads instead for food for my birdies (remember when every card had to have great big brads impaled upon it?!). Mama Elephant stamps and Simon Says Stamp dies were used for this simple card. The paper was a snippet from the depths of my paper drawer! Lots of us find masculine cards a little more challenging to create, however we still had a splendid gallery of cards last week with some great ideas to inspire future makes. 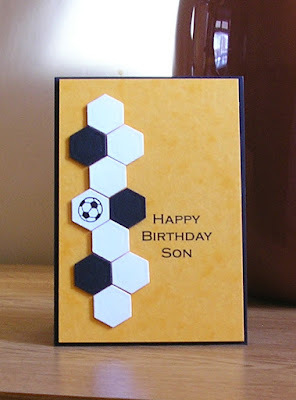 Such clever use of linking the hexagon backdrop with the shapes on the ball... so eye-catching and perfectly CAS! 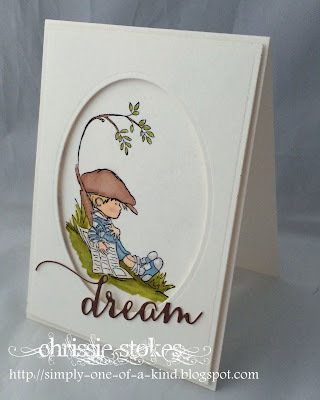 Laurie's colour choice and simple use of the dies and sentiment says it all. The personification of "Less is More". 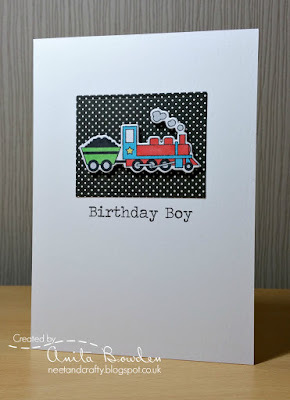 The perfect clean and simple one layer, masculine card... great placement and super neat stamping! Please take the ShowCASe badge from the page at the top with our compliments! 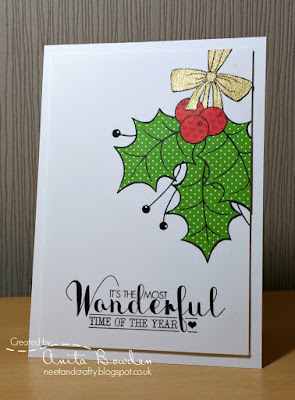 There's still a smidgen of time left to join in this week's sketch challenge but do come back tomorrow for our Lucky Dip Challenge, with a Guest Designer!! following our one layer AUTUMN themed challenge. balanced by the white space above! really makes the focal point work well. awesome and worthy of our ShowCASe this week. before we share details of the new one tomorrow at 8am BST, so join us then! Autumn has decidedly started to make an appearance here in the UK. There's a definite nip in the air and the trees are really starting to show off their autumnal beauty! There were some lovely cards in our gallery reflecting this last week too. Here are our cards to give a little inspiration! 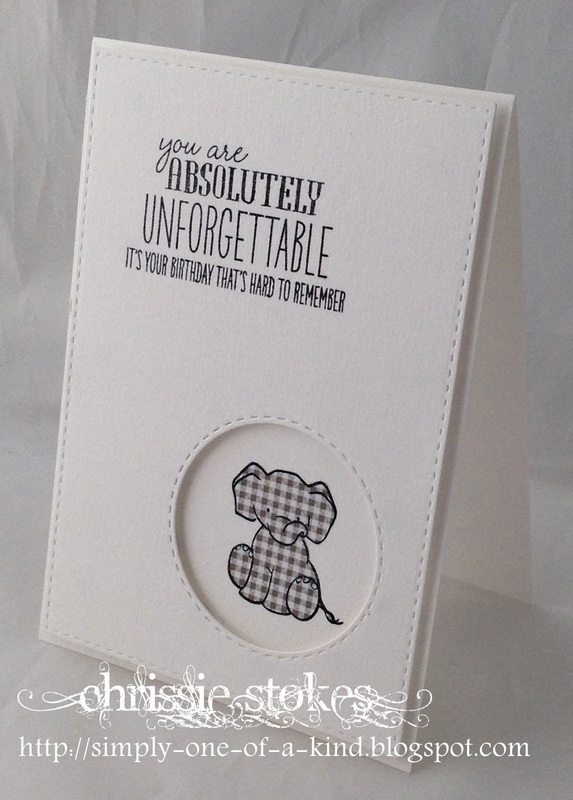 I've a die cut masculine card, with a Memory Box digger against a Memory Box sentiment. The background was sprinkled with Brusho greens and then spritzed with water. I coloured the digger with Copics and filled in its window with some Glossy Accents. 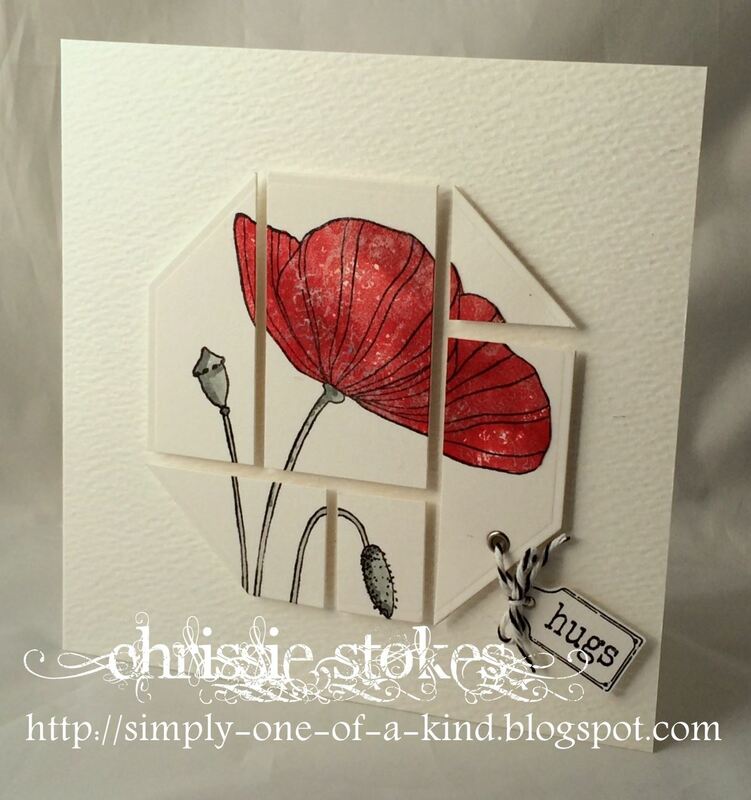 Here is a sweet Lili of the Valley image, gently coloured, set within a die cut frame and accompanied by a triple layered Penny Black die-cut sentiment. Although a masculine image, this card could be for either gender. 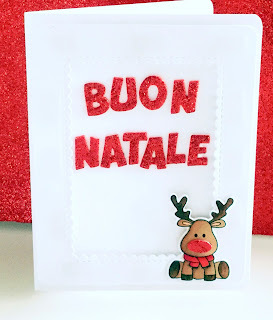 As I use double sided tape to adhere die-cuts, once stuck down, I sprinkled a little talc behind the part of the sentiment which overlaps the aperture so that it wouldn't get stuck to the picture when squished in the envelope. for me, of this gorgeous Out of This World set from Clearly Besotted. I inked a sun / planet. Then with Blueprint Sketch, Faded Jeans and Black Soot. and mounted them on 3d foam, accented with wink of stella and glossy accents. One for the younger men, as I'm always lacking in my stock of these cards. the Doodlebug Kraft in Color paper pad and adhered this flat to my card base. co-ordinating die, and then coloured it in with ProMarkers. The train was then popped up on 3D foam and the sentiment from the same set stamped below. We had some beautiful submissions for our jewel colour challenge and our showcase this week reflects the wonderful talents of our participants! As always it was a difficult choice! Such a classy creation with touches of gold and the faceted heart was a perfect choice to showcase the ruby tones. The abstract background stamp was ideal to create the diamond, and the embossing with the ink sprinkling created a wonderful result. 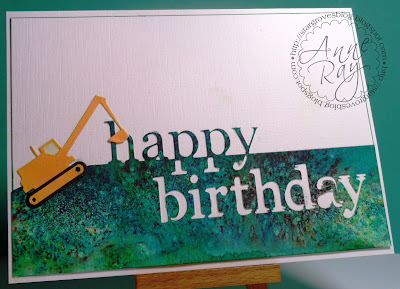 Christine created such a beautiful marbled effect with her alcohol ink technique which just popped against the wonderful white frame and die cuts. We're sure you'll agree that all of these cards are simply stunning and so worthy of our ShowCASe this week. Please take our showcase badge from the page at the top and display it with our thanks. There's still a smidgen of time left to join in this week's one layer challenge, but a completely new one will begin tomorrow at 8am BST, so join us then! Would you believe it... it's One Layer time again! These months really seem to roll around quickly. we have clear skies and a little sunshine, nothing looks finer! 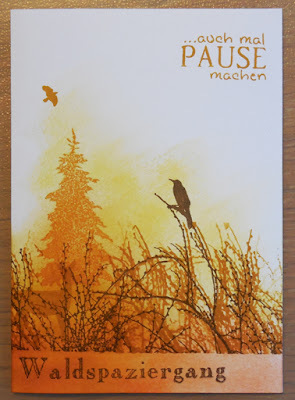 I masked a horizontal panel and blended various Distress Inks in autumnal tones. I then took a leaf image from the Autumn Silhouettes set by Kanban, spritzed the stamp with water and then stamped on my panel one at a time, leaving the water to settle for a short while and then blotted with a paper towel to remove the colour. 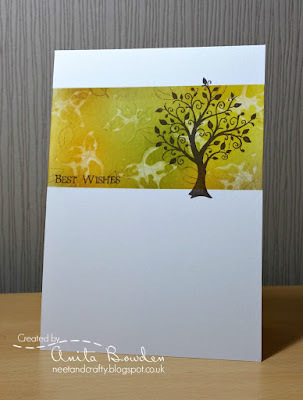 Then, using second generation stamping I randomly stamped a small linear leaf image from the Mini Shadows set by Honey Doo Crafts in Walnut Stain Distress Ink. After removing the masks I finished by stamping the tree and sentiment from the same Kanban set in Versa Color Pine Cone ink. 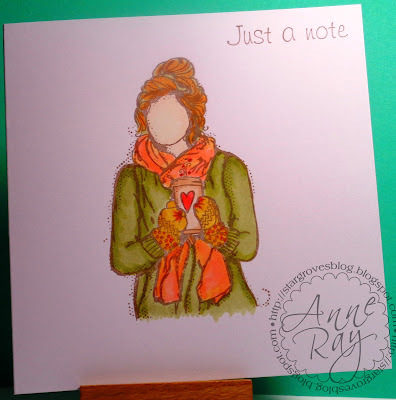 This Unity stamp is all about autumn to me: wrapped up against the chill and with a warm cuppa! She's coloured in autumn shades using Copics and I've added a House Mouse sentiment. 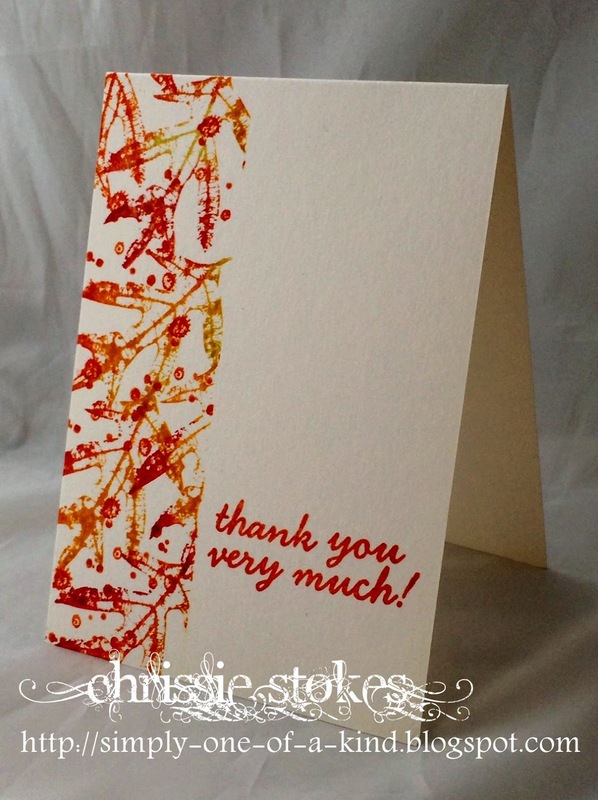 Here is a simple masked card, stamped with Stampin' Up's French Foliage stamps in a variety of Distress Ink autumnal shades. The sentiment is from Hero Arts. Autumn always make me think of thankfulness! For this one I've gone with Autumnal colours rather than the usual 'leafy' images. 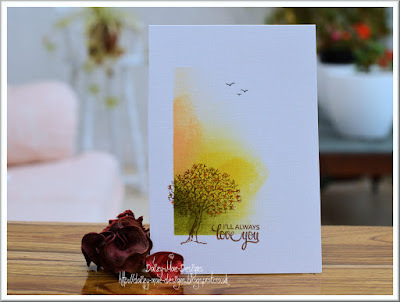 sentiment in Versafine black ink from Clearly Besotted: Simple Silhouettes. 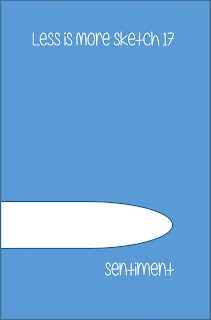 Clean and Simple rules which are shown at the top right of the page. just three choices - so we've got FOUR this week! red-nosed Rudolph? The perfect way to add some shine! 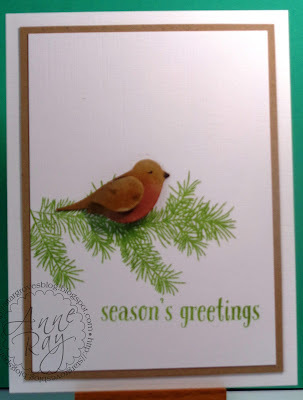 on the card with the perfect shiny ornament and sentiment! and what an adorable little image and design! until 10pm BST tonight to enter before a new one starts at 8am tomorrow! by leaving lots of friendly comments along the way! your contribution to our challenges and hope you enjoy your prize. Have you got that Saturday Morning feeling? so first up let us introduce you to our sponsor for October. 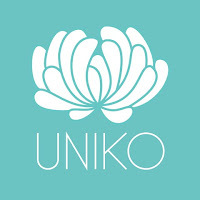 of a £15 gift voucher to spend in the Uniko Studio online store. Do check out the shop HERE to see the brilliant collections. your wonderful creations but please remember to keep your designs clean and simple. interest to the sides of the purple panel. To finish a couple of sparkly jewel sequins! Stampin' Up's So Very Grateful set and the sentiment from Clearly Besotted's Stylish Flowers set, both in VersaMark ink. I then heat embossed in Wow! before being popped up on 3D foam strips. 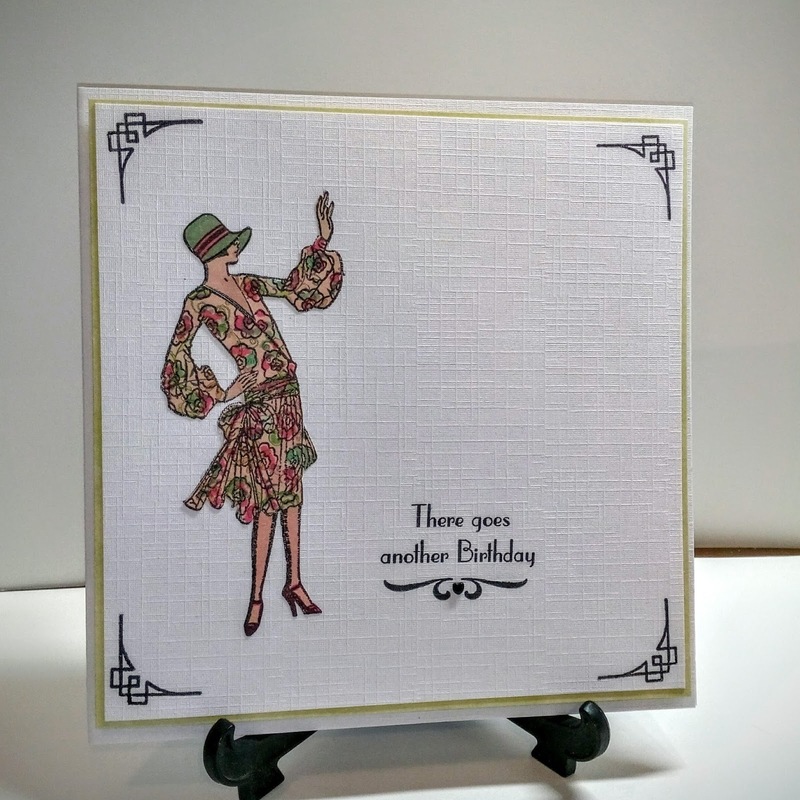 The sentiment is from Stampin' Up Age Awareness. 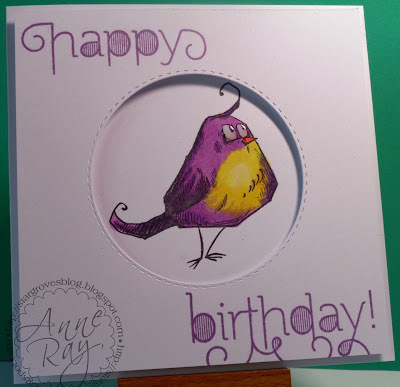 Some time ago I saw a card made with a Crealie Patchwork die and I thought I could do something similar without using that specific die. This Penny Black image was paper pieced using some card I had coloured by smooching Distress Ink and Inka Gold paste. This ruby colour looks really rich and intense. After paper piecing the petals I cut the image with an octagon die and then chopped it into pieces, mounting them with dimensional pads. The sentiment from Lily of the Valley was attached with a length of twine and an eyelet. for your fellow Limettes - we all love comments! Our Technology challenge had a few people scratching their heads trying to think of ideas, but some really super cards emerged... it certainly was a challenge, well done everyone who entered. Following another sketch but perfect for our techy challenge! 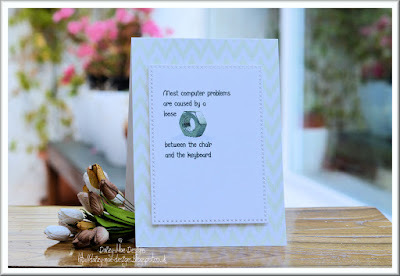 Often tricky subjects can be overcome by using computer generated sentiments as Viv did here... this is a really fun one! 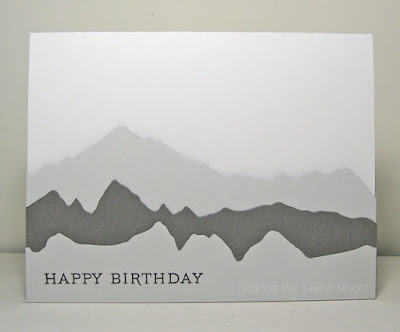 We love the simplicity of Heather's card. Lots of fabulous white space really makes the image pop! Do take the ShowCASe badge from the page at the top to display on your blogs, with our thanks. You have until 10pm BST tonight to enter this week's challenge and a then new one will begin at 8am BST tomorrow!